SpaceX's Falcon 9 rocket fired nine main engines on a Florida launch pad Saturday, completing a major test before lifting off on an International Space Station resupply flight Oct. 7. The Falcon 9 rocket during Saturday's static fire. The two-stage rocket rolled to the launch pad Saturday morning, and a computer-controlled sequence filled the booster with kerosene and liquid oxygen propellants beginning around midday. The Falcon 9's fuel tanks were pressurized in the countdown's final moments, leading to ignition of the rocket's nine first stage Merlin engines at 1:30 p.m. EDT (1730 GMT). Steam and exhaust flowed out of the flame trench at Complex 40, the Falcon 9's launch pad at Cape Canaveral Air Force Station, Fla. The Merlin 1C engines were supposed to fire at full power for about two seconds, generating more than 800,000 pounds of thrust as the rocket remained firmly connected to the launch pad. Called a static fire, or hotfire, the test verifies the engines, rocket and ground systems are ready for launch. 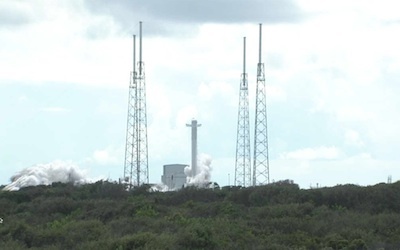 SpaceX confirmed the static fire test was a success in a statement released Saturday afternoon. "We will need to look at data to verify all systems are go for launch, but we completed the static fire test today as planned and on time," said Katherine Nelson, a SpaceX spokesperson. SpaceX has scheduled a static fire test before each of its Falcon 9 flights to check the health of the engines and wring out problems before launch day. The exercise also serves as a rehearsal for the launch team. The Falcon 9 rocket has achieved three successful flights since 2010. Engineers will remove the rocket from the launch pad and return it to its assembly hangar, where workers will attach a Dragon spacecraft loaded with supplies and experiments bound for the space station. The rocket will also orbit a second-generation two-way data communications satellite for Orbcomm Inc. Launch is set for Oct. 7 at 8:35 p.m. EDT (0035 GMT on Oct. 8), and the Dragon capsule will reach the space station Oct. 10, when the lab's robotic arm will grapple the unmanned freighter and attach it a connecting port. The flight is the first of 12 cargo missions under a $1.6 billion contract with NASA. SpaceX received approval from NASA in August to begin operational deliveries to the space station. Two test flights of the Dragon spacecraft assured NASA the capsule meets stringent safety requirements for visiting the space station. In May, SpaceX successfully accomplished the first commercial round-trip flight to and from the complex. The Dragon spacecraft is scheduled to stay at the space station for about 18 days on this mission, departing from the outpost Oct. 28 and returning to Earth with a parachute-assisted splashdown in the Pacific Ocean. After the retirement of the space shuttle, the Dragon capsule is the only vehicle capable of returning equipment from the space station to Earth.